The funeral service for the late former first lady Mama Betty Kaunda has been postponed to a date to be announced later. This was after the husband Dr. Kenneth Kaunda fell ill and has since been admitted to the University Teaching Hospital (UTH). 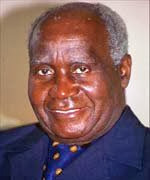 Colonel Panji Kaunda the son to the former head of state has confirmed the development to QFM news in a telephone interview. Colonel Kaunda said his father Dr. Kaunda started feeli9n unwell because of the suspected stress saying he has not hard enough rest from the time that Mama Betty died.